Iiyama is bolstering its range of available gaming monitors with the release of a new pair of products as part of its G-Master series. 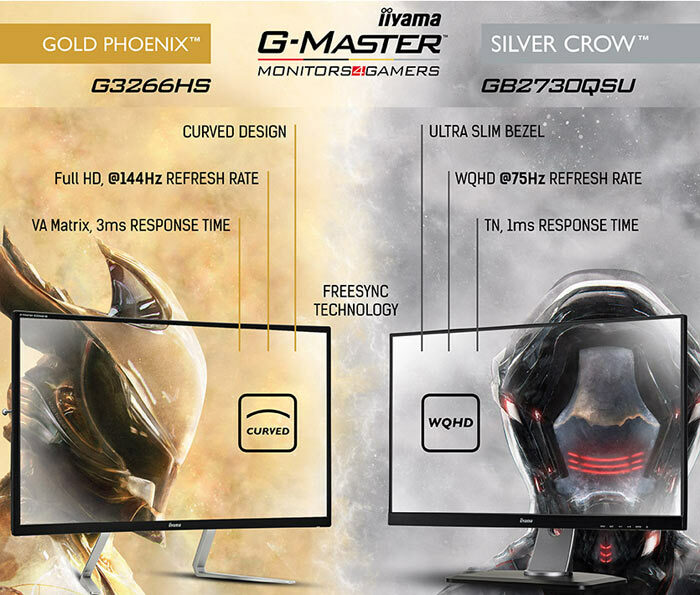 The new Iiyama G-Master GB2730QSU Silver Crow will be released in the first week of December (next week) and the G-Master G3266HS Gold Phoenix will be released in the last week of November (this week). 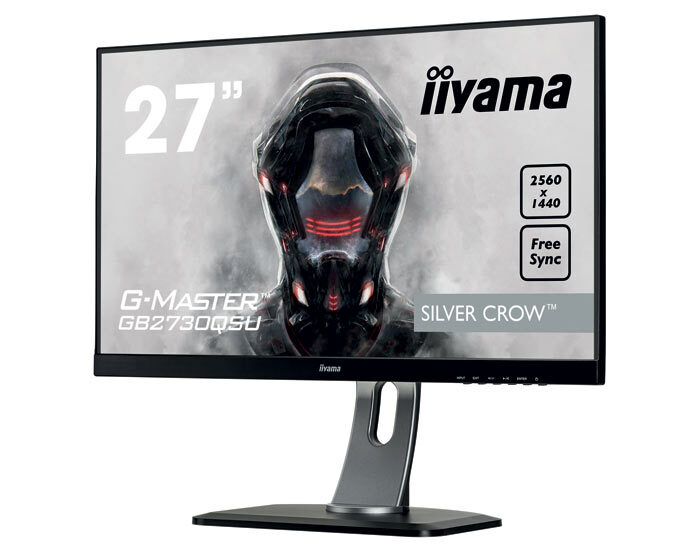 This is a 27-inch monitor that replaces the existing Silver Crow G-Master GB2783QSU in Iiyama's range. It sports a TN type screen with a resolution of 2560 x 1440 pixels, a 1ms response time and a refresh rate of 48-75Hz with FreeSync compatibility. Other key specs are its max brightness of 350 cd/m² and contrast ratio of 1000:1. The Silver Crow features DVI, HDMI and DisplayPort, a headphone socket, and a USB 3.0 hub with two outputs. Stereo speakers (2x2W) are built-in. Iiyama's supplied monitor stand (Vesa 100mm compatible) is adjustable for height (130mm), pivot (90°), swivel (90°; 45° left; 45° right), and tilt (22° up; 5° down). This is a 32-inch monitor and is the first curved (1800R) gaming monitor in Iiyama's range. It sports a VA type screen with a resolution of 1920 x 1080 pixels, a 3ms response time and a refresh rate of 48-144Hz with FreeSync compatibility. Other key specs are its max brightness of 300 cd/m² and contrast ratio of 3000:1. The Gold Phoenix features DVI, HDMI and DisplayPort, and a headphone socket, but no USB hub. Stereo speakers (2x2W) are built-in. Iiyama's supplied monitor stand (Vesa 100mm compatible) is not very adjustable, you can only alter for tilt (12° up; 4° down). Both the above monitors feature Iiyama's picture control features for low blue light and flicker free viewing. Iiyama sticks to conventional terminology for its image adjustments; there is no 'Dungeon' mode or similar just adjustments to saturation, gamma, black levels, luminance, colour temperature, and so on. Both monitors feature an 'overdrive' option to eliminate blur when the monitor is handling "very fast graphics". 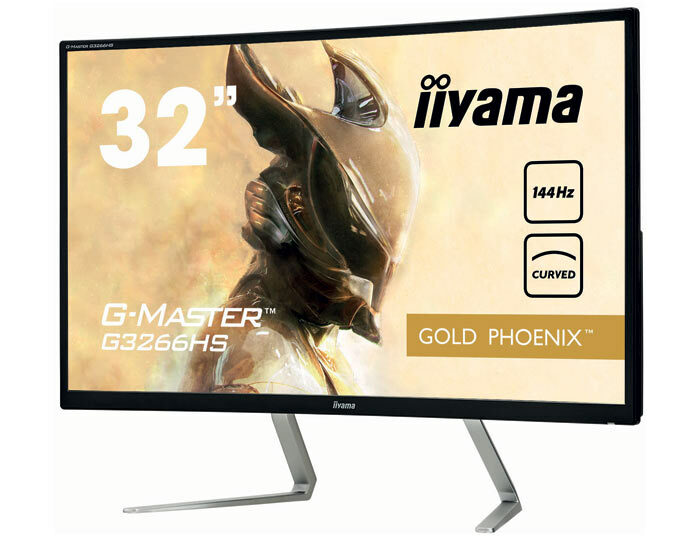 Iiyama didn't supply us with the suggested retail prices for its new gaming monitors but I found that the G-Master G3266HS Gold Phoenix is already listed at some retailers here in the UK and is priced at approx £370. The stand on the 32' screen is just wrong on so many levels. If it's sturdy enough, I don't have an issue with it, I think it makes it unique, in a good way. still pushing 1080 .. and at that price ? Running quite a few games at 1080p, high-ultra settings with lots of Anti Aliasing (a requirement at 1080p) and 100fps+ will bring even a 1080Ti to its knees.